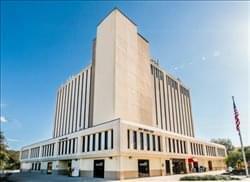 Find My Workspace lists over 95% of the executive office suites market in Largo. Simply click Request Quote to check pricing for one office, or Add to Basket for multiple offices. From executive suites to more than 5,000SF on the top floor, this eight-story office building in the center of downtown Largo is the city’s most well-known building. This center offers a state-of-the-art VoIP phone system, direct dial phone numbers, conference/media room plus two additional conference rooms, and break rooms with complimentary coffee. Offices are furnished or unfurnished. The lobby has been recently renovated, the centre have banking on the ground floor, and offer 24 hour access for tenants. Management and maintenance onsite Monday through Friday.